So this started out as a short list and kind of bloomed into quite a weighty post, so I’m sorry if it’s a pain to read. I wanted to list some of the stuff that I had achieved and things that made me happy in 2018, I also wanted to broadly cover personal goals I would like to achieve this year. This year we got to see so many people that we mostly talk to online, there were some new faces and some already familiar to us too. Broadsider – We had the chance to meet BroadSider twice in 2018 when we were up in his neck of the woods, Broadsider is a wonderful person that is very entertaining regardless of if he is streaming or in real life. We got to visit one of oldest gaming friends which involved a trip on a ferry, which is always an adventure travelling to an island. FluffyBunEsq – Fluffy doesn’t live too far away so we met up with him a few times this year sometimes in Cardiff other times closer to where he lives. BoopleSnootBex – We met up with Boople on one of ours outings to other parts of the country, despite it being a last minute event we all had a great time. Lucanaii and EngineerAirhead made time in their UK visit to come to Wales, it was amazing to met them both and we had a lovely day out in Cardiff. One of my dearest and oldest internet friends (back from the dial up days) was visiting London with her other half, so Munki, LittleTroll and I travelled up to the big smoke to and had a wonderful day catching up chatting about things that had changed since their last visit. There was of course Twitch London but more about that later. 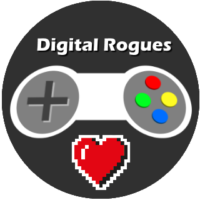 I raised over £650 which is a new personal best for me and collectively our Digital Rogues team raised £2,264.86 which is a stunning 350% better than our previous years total. We were very lucky to have got some amazing gifts to give away from Developers and our community members. Munki and I decided to go to Rezzed it was kind of a last minute thing but there were two good reasons. Firstly was to met Becky Frost from Special Effect who has been one of the primary contacts that we have conversed with for GameBlast, We had chance to sit down, grab food and have a wonderful chat. Becky is an amazing person and really has such enthusiasm for the work that she and Special Effect does. Another attraction at Rezzed was to get the the chance to play on Megaquarium, the first playable Demo which I was very excited about and impressed by. Cultist Simulator – I game I that was already playing since the Kickstarter, but got some great stickers for my clan. Yorkshire Gubbins – We packed some Hendersons crisps freshly collected from Yorkshire to give to the wonderful creator Charlotte Gore. Unforeseen Incidents – This game was being shown and I got to play a Demo and speak to the artist, I was sold on the point and click adventure game, instantly. Siege & the Sandfox – A lovely looking platformer that I got to play briefly and the gameplay reminded me of old school platform games were there was more than one way to approach a situation. 2018 was great for RPG’s I got to run D&D 5E starter sessions for new players as well as running 2 campaigns which are so funny in various ways, but always a good laugh. Breaks with my clan game allowed me to GM a game of Achtung! Cthulhu (Fate Edition) and Monster of the Week, my fellow clan mate GM’d which allowed me to play Blades in the Dark and a custom Fate Accelerated game themed on Planetside. Each of these was very different and allowed us to try out new systems and settings, all of them were very fun. Since I stream for fun, getting affiliate was never a goal that I had set out to achieve, however at the end of May I finally ticked all the required boxes and got the email. I only really stream once a week so I hope people don’t expect too much from me, however I appreciate everyone that stops by my streams, Sunday mornings isn’t when folks generally wake up early, so having folks tune into me while they are doing their usual household chores is kind of great. I like having the emote but I’m still not 100% sure on how to have to fill all of that stuff in my on Tax Self-Assessment forms next year. The meetup in London was kind of last minute deal, we had seen it was happening but there weren’t any streamers we knew going, so we dismissed as being the non-drinking type, social events can kind of be awkward when most around you are drinking, even more awkward if you don’t really know many people. When Psyche confirmed she would be attending, Munki and I started planning to ensure that we could make it, a round trip to London was the easiest since we didn’t have time to figure out a hotel or child care for an extended duration. We were in the unusual situation that we had met Psyches other half in 2017 while he was in the UK on business, but alas we had failed to manage to meet her on any of her trips, such as FrontierCon and GamesCon. Having a child means that travelling for GamesCon isn’t a viable option, so we had to make doubly sure that we could attend this event. Wonderfully Psyche and Kolo were happy to meet before the event it’s self, which was rather awesome as we got to hang out and chat in a more causal situation (plus we didn’t have to compete with music and the louder background noise of revellers that we would encounter at the event later that evening). It was wonderful to meet Kolo who is such a nice person and both her and her community are very welcoming, we got to meet some of her community members later that evening. 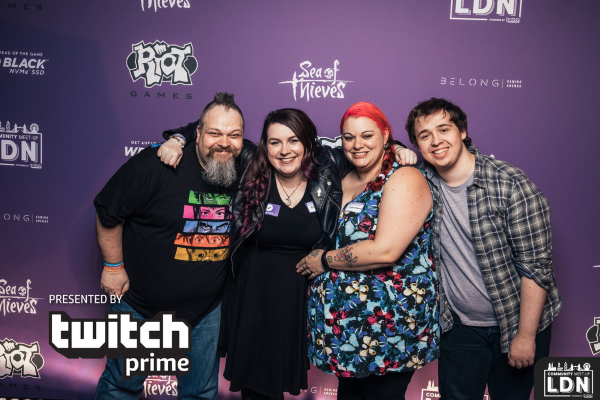 Finally got to give Psyche a big hug, after many years of watching her streams, I can confirm she is every bit as lovely in real life and we were so pleased that we had made the trip. Also that day Breadicus was also able to meet up beforehand which was great to put a face to the name of community member, we met PaulArcher in the event itself and he’s as funny in real life too 😀 . As I alluded the evening event was nice but as with anything of that nature, loud and busy for the most part, we got some free swag and a lovely photo. We also managed to see Becky Frost who was in full SpecialEffect mode with a squad of volunteers backing her up. Munki and I made our exit at 9 so we could get the last train back to Wales, all in all it was an absolutely lovely day. I’ve not really pushed the system with anything meaty yet but I’ve been pondering getting a new shooter at some point, now may be that time. So this year was quiet tough for me as I struggled with my mental health to the point that I was off work for an extended period of time. I had moderate Anxiety and Depression but to took me a good while to recognise that there was a problem. I got some help from my employer who put me in contact with a Psychologist service with a handful of sessions covered by them. It helped me to get back into work, I’m not completely rid of though thoughts that were causing the issues but I feel alot more positive about facing them head on. I am getting back into GMing and will restart a campaign I had to pause due to my health issues. Planning some more RPG workshops to help people get into playing and maybe branching out away from DND, so others can taste different games. I also have so many RPGs I want to try out at somepoint some in space, some hero settings, some cyberpunk, others completely off the wall. We are all registered and getting setup for this years GameBlast19, this year we hope to have another member joining us for the fun and we can all achieve new personal bests. In the next month I will be trying to shape up my stream list and focusing on drumming up sponsorship as well as sending out some emails to game developers to see if we can get any content for giveaways. I think as we had issues distributing physical items last year we are likely to stick to digital items for the most part. I want to get back into streaming with a web camera again, after I kind of fell out of the habit in the early part of the year I never returned to it and I’d like to fix that If I can. I used to do an adhoc Thursday evening stream that focused more on Role Playing and map creation, I’m not sure if I want to return to map making again but I’d like to throw in some extra streams maybe once or twice a month. You knew it was coming, as always I’d like to challenge myself to try and blog at the very minimum one entry per month. I hope that it will be more frequent but let’s start somewhere realistic shall we. I need to review my BlogRoll. I also need to get better at checking my RSS reader and commenting more on other peoples posts more often. There are so many good games coming out and so many games in my Steam backlog, I want to try and get my played percentage from 51% (via steamdb, 459 out of 898 games played) close to 55%. I am gonna try and stop picking up bundles when there is only one title I’m remotely interested in contained in the bundle. I hope that see you all again soon, I hope your 2018 was enjoyable and that your 2019 is even better. Reports are out that Google has completed the purchase of Twitch.Tv for $1 billion which confirms the rumours about the purchase that were circulating in May. I’m interested to see what steps Google take with the streaming service, whether it will include auto-saving of shows directly to The YouTube site along with tighter integration or if the Brand will be kept complete separate (save being able to logon with Google Accounts ofc). Whichever direction it would surprise me if there is much change before Christmas. If the Google account are used the recent Google’s reversal on Real Name policy will at least mean streamers/viewers real identities are directly exposed to others, if they use decide/must use a Google account. As with any time we see companies bought out, loyalties will be tested and it wouldn’t surprise me to see some well known streamers jumping ship to other streaming services such as UStream or Hitbox, but with an already strong Apple and Android presence other services may seem lacking. Sadly my upload speed currently isn’t good enough to support Streaming my adventures in gaming, fingers crossed that the upgrade at the exchange completes sometime soon, as half my town have fibre, just not the half in inhabit.